When I first purchased my Pentax 645z camera the first thing I wanted to do was take it out and do a test shoot to see what it was that I had bought. I immediately went to an ordinary, boring beach near where I live to capture a sunset, test out the camera’s ergonomics and get a feel for what it’s images would be like. The first two images below are from that evening and I was pleased with how they turned out, not because of the camera but because I was lucky to get a nice sky and the images stand on their own as nice, simple landscapes. Usually when looking for landscape images I am wanting interesting foregrounds, leading lines or other elements that can be used to build a composition. Often I like featuring an iconic landmark so that it is recognizable as a certain place. Onto this framework I then layer in the right light and a nice sky to hopefully get a good result. 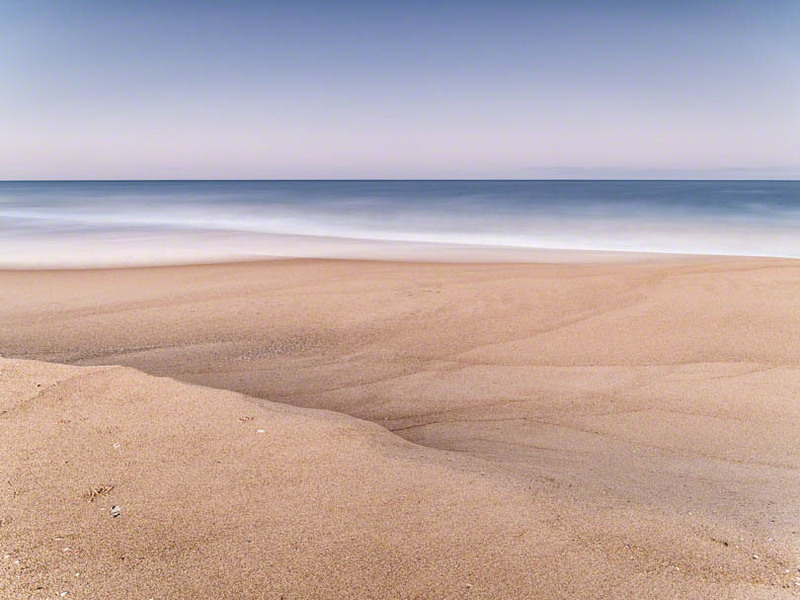 These images though could have been taken on any beach in the world, don’t have any particular geological or other feature to form a composition with and the only foreground is a stretch of sand. 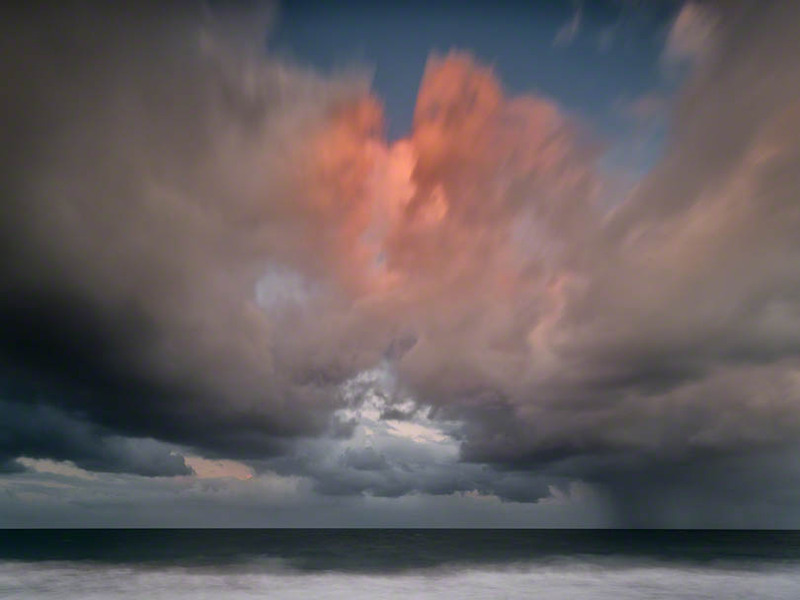 They do however, contain the elements that will often make or break other landscape photos: that is light and weather. 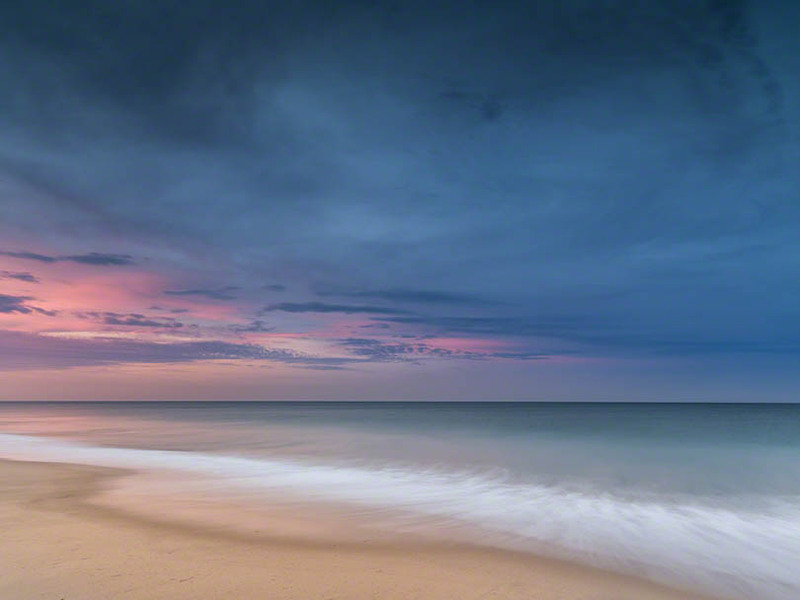 Since taking the first few images that evening I have been back to the same beach many times in order to capture more images under different lighting and weather conditions. I’ve called the series Project Spindrift and am very pleased with how they work together. I’m sure they are not to everyone’s taste but I enjoy producing many different images with different moods and styles from the exact same location. They are landscape images with virtually no landscape in them! So this leads me to my point. For anyone starting out in landscape photography I would recommend taking a similar approach and applying the basic principles that follow, to learn some of the important skills necessary to control the light. You don’t need to travel to the most awesome landscape locations to learn, you can do it by paying frequent visits to a place that is close to you – preferably somewhere that has simple elements that will make only a minimal impact on the image. A beach, sand dunes, a lake, an old shed in a field, a salt pan whatever you have nearby. I think it is fair to say that even considering the location itself, light is the most important factor for landscape photography. All of the points below are all in some way related to light to a greater or lesser degree. As landscape photographers we are all looking for nice light to show our chosen subject the best or most interesting way. Photography in brighter times of the day is almost always a waste of time compared to the productive output you will achieve if you shoot a little before and a little after sunrise or sunset. Unless you are shooting in far northern climes such as Iceland where you will get an all day ‘golden hour’, the available time is invariably short so some planning is worthwhile to make sure you are in the right place ready for the shots you want when the light starts. Another consideration is the direction of light. The location where all these images were taken faces west so I was either shooting directly into the sun or had it at my back. These two situations result in very different effects. Image 2 obviously was taken before sunset with the sun mostly hidden behind clouds. The lighting is dramatic with high contrast but golden and low angle as well. Image 4 was taken in summer with the camera pointing roughly southwest and the sun coming up behind me from an angle south of east. The lighting is uniform and soft and the far horizon is taking the reflected color from the sunrise. The prevailing weather will have a big impact on your images and you may choose certain weather to photograph certain subjects (such as an overcast rainy day for shooting a forest scene). It is mostly about cloud cover. A complete lack of cloud cover can be difficult to work with but is still doable as Images 3 and 6 show. A sky with scattered clouds will be ideal for most subjects as it allows the sun to break through and bring colour to a sky in the way that a completely overcast sky will not. Don’t discount stormy weather. Image 5 was shot shortly before rain started and looks quite dramatic because of the sun coming up behind me, splashing the tops of the rain clouds with colour. Some of the most dramatic and amazing looking images can be achieved with huge storm clouds towering over a landscape – a situation which will make you grateful for a weather sealed camera if you have one. Landscape photography is mostly a tripod bound exercise for good reason. Since the times of day when the light is best also means the light is low, shutter speeds often range from slow to really slow. However, this is no reason not to play around with the shutter speeds to create different effects. By bumping up the ISO a little we can reduce our shutter speeds a bit if you want to avoid movement (such as branches or grass being blown by the wind) or change the movement effect of the scene. 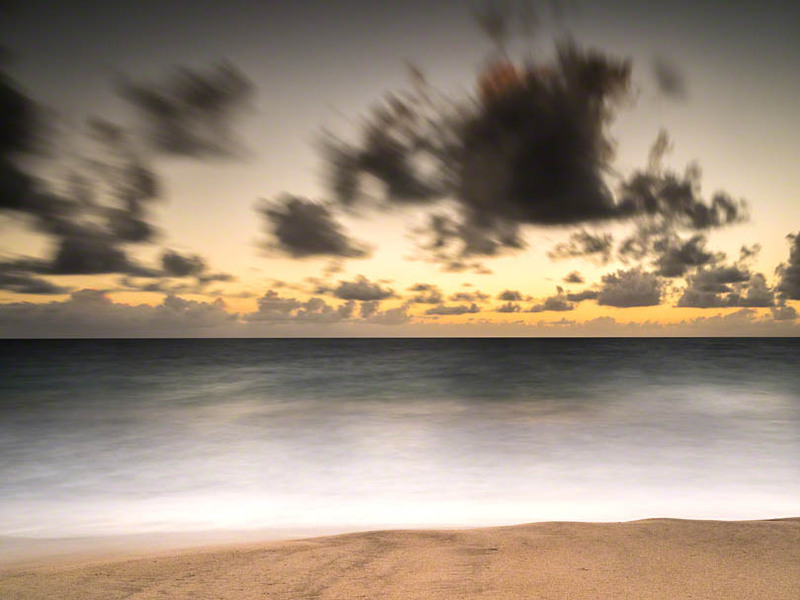 Shorter shutter speeds around 1 second such as that shown in Image 2 will show a small amount of movement in water while still allowing quite clearly defined clouds. This can lend more drama to an image. Dragging shutter speeds to around the 30 second mark results in a very different look. Now things are reversed: the clouds look like they are moving but the water looks still because all shape has been averaged out if it. Even longer shutter speeds into the minutes will further stretch time out and can result in surrealist or minimalist images. We need to manipulate these shutter speeds according to how much motion there is to work with – for example how fast the clouds are moving. To get these slow shutter speeds we use the naturally low ambient light levels or add filters or both. 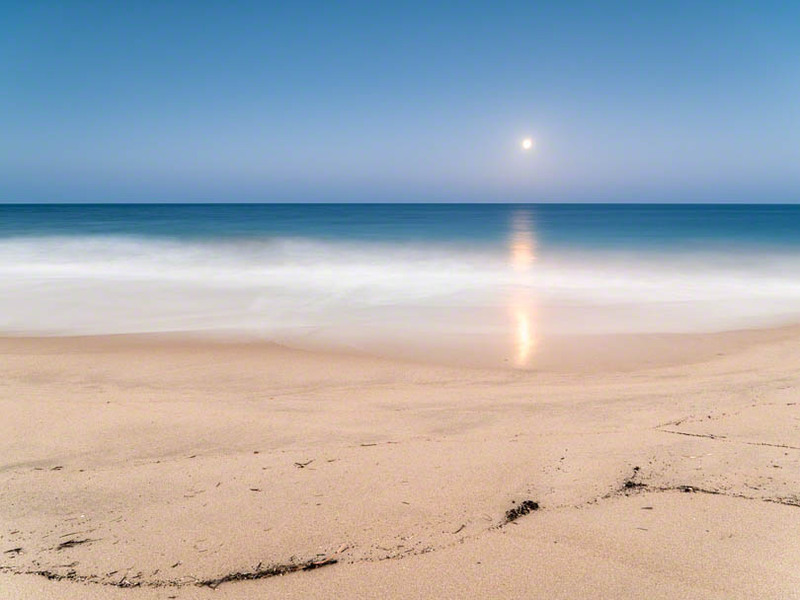 Regard filters as an essential part of landscape photography. They allow us to control light in-camera in a way that is difficult or impossible to do in Photoshop. 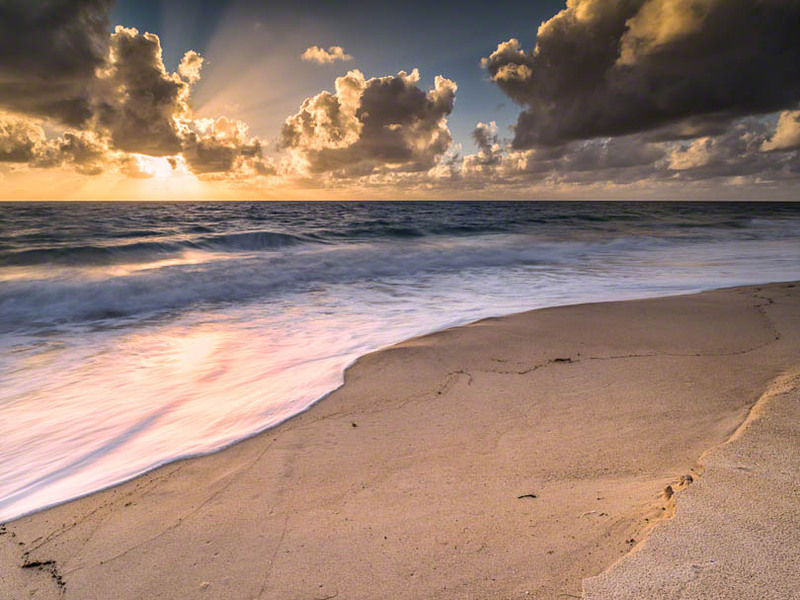 The three essential filters are a circular polarizer, a graduated neutral density (GND) and a neutral density (ND). A circular polarizer is not of much value at sunrise or sunset or with wide angle lenses but they are handy for water falls, forests, wet foliage or streams in cutting down reflections. I also occasionally use mine as a stand-in ND filter. GND’s are amazingly helpful to even out the exposure between sky and foreground provided they are the square type that can fit into a filter holder (such as a Lee or Cokin system) that allows the filter to be moved up and down to suit the horizon. You may still need to put a digital GND on later in Lightroom but the need for it will be less. ND filters (my favorite is the Lee Little Stopper) helps us achieve that really long exposure affect that smooths or stretches out all movement such as in Image 6. It is essential to get a really high quality filter (they are not cheap but better to buy once than upgrade later) as cheaper filters often have colour cast. They are supposed to be neutral after all. I will often use a GND at the same time as an ND stacked together in the filter holder. As I hope I have shown here, repeated visits to the same location will net different results. There is no such thing as the definitive image of a location, there is always a different day with different weather and a different composition. It can take many visits to a place before the light or weather matches our expectations or pre-visualization. Patience and persistence are the landscape photographer’s friends. There are times when we have to visit a far flung location that is planned in advance knowing we may not get a chance to get back quickly or even at all. This is where diligent planning comes in. Make sure you research the climate and weather patterns of the area, possible locations, sunrise and sunset times and the geography of the area. Apps like the Photographers Ephemeris allow us to check sun angles and moon-rise times and other useful information. With all the planning done we go and we hold our breaths hoping for that perfect morning shoot.